Retiring and becoming a senior citizen does not necessarily mean that an individual becomes physically incapacitated. Providers of senior home care in Oshkosh know that there are many older adults who enjoy an active lifestyle. 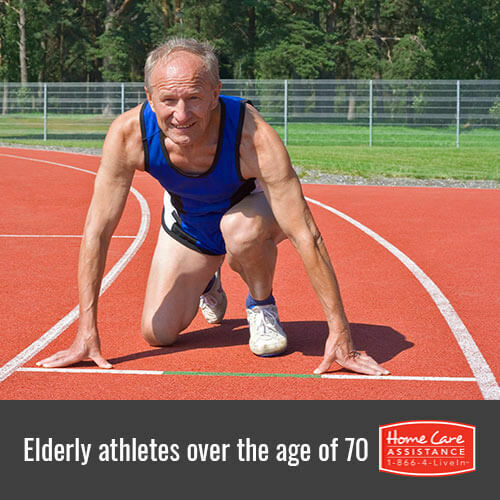 Some seniors fall into the extreme end of the spectrum and are celebrated as amazing athletes. Health and fitness remains a priority for this retired Illinois Wesleyan University professor. His favorite sport to take part in is cycling. At the age of 95, Miller was the oldest competitor in the 2013 National Senior Games. In 2006, Bonilla read an article in Men’s Health concerning the sport of Crossfit and began training and competing. In 2012, Bonilla placed 17th in the Crossfit world competition in the 60+ division. At 76-years of age, he continues competing in the sport and is a Crossfit instructor in Brooklyn, NY. At 86 years of age, the “Iron Nun” remains an avid Ironman and triathlon participant. Her running career began with jogging at the age of 48. Crediting the “man upstairs” as being her coach, the Roman Catholic nun has completed 360 triathlons and 45 Ironman competitions. Professional cyclist Alison Tetrick has a unique relationship with one of her competitors. He also happens to be her grandfather, Paul Tetrick. The 86-year-old won 12 U.S.A. Cycling Time Trial Championships. He also placed ahead of his granddaughter in the 20K Paula Higgins Memorial Record Challenge Time Trial. At the age of 66, Rounds became interested in the sport of rowing. Since that time, the 87-year-old achieved 20 world titles in the sport. Though frequently winning the event, Rounds strives to break the 2K-world record. In 2013, Miura became the oldest person to reach the summit of Mount Everest. He was 80 at the time. The senior mountain climber boasts having made the journey three times. Miura was over 70 when he confronted the famous summit for the first time. When it comes to maintaining vitality, Home Care Assistance can help. As the leading provider of stroke, dementia, and Alzheimer’s home care in Oshkosh, we promote the physical and emotional wellbeing of the seniors in our care. Learn how we can help your loved one achieve the golden years he or she deserves. Call 920-710-CARE (2273) today to set up a free consultation with a reliable Care Manager.